Two movie theatres in Sydney, Australia are pilot testing QkR, a mobile app that lets customers place orders on their smartphone via NFC or QR codes and then have their order delivered to their seat. Two upmarket Hoyts La Premiere movie theatres in Sydney, Australia have become the first to pilot test QkR, a “queue-busting” mobile payments app that supports QR codes and NFC. 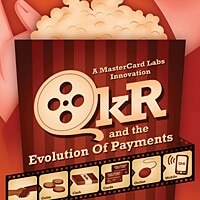 QkR has been developed by MasterCard and is being offered by Commonwealth Bank, which recently launched an NFC-based payments service called Kaching. The QkR app lets movie-goers at the Westfield Chatswood and The Entertainment Quarter cinemas order food and drinks directly from their seats using their smart phones. Purchases are then delivered to their seat. For the pilot, each seat in the theatres has been equipped with an NFC tag, QR code and printed seat code. Customers with an Android or iPhone download the QkR app to their phone and pre-register a debit or credit card they will use to make purchases from the digital wallet app. To place an order, they simply scan, tap or type in the details of their seat number. The app then displays a menu of available food and drink items. The customer then simply selects the snack they wish to order and completes the purchase. The details of the items ordered and the customer’s seat number are then sent to Hoyts staff so that the order can be fulfilled.